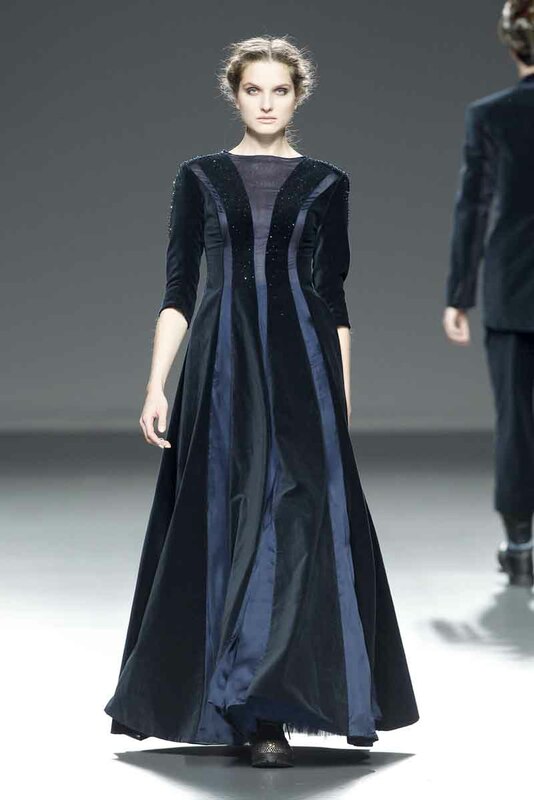 On Tuesday, February 18, 2014, at the Feria de Madrid, Vimpelova unveiled the Vimpelova Fall 2014 collection under the auspices Samsung EGO Innovation Project held in conjunction with Mercedes-Benz Fashion Week Madrid. The woolen coats and dresses or the traditional printed cotton shirts are embellished with glass beads embroidery, shaped in the coat of arms of the Moravian and Bohemian towns. The collection highlight is in the technical details, the finishes and the pattern made by the designer itself. Opposing are the key points – heavy wool against soft silk, military coats against elegant dresses, the traditional against the modern, muted colors against the brightness of Czech crystals.